Jamal al Yindannim is a member of The Flame Brotherhood, a group of Flame Mages dedicated to controlling Zakhara and purging other forms of magic. As a high level member, second only to The Bonfire, Jamal is in charge of removing the threat of the Hanif tribesmen, al-Badians of The Haunted Lands who are fanatically loyal to the Grand Caliph. As part of his plan to do so, he has constructed Krak al-Niran, the Fortress of Flame, from which he launches attacks against them. The fortress's expenditures are met in part by the machinations of Yodfah. 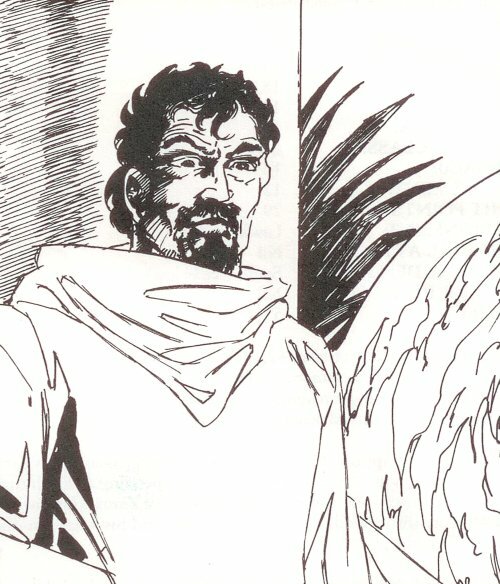 The party first encountered Jamal at an oasis on the fringe of The Haunted Lands when he and Yodfah were attempting to ambush and capture Kheldun al-Hanif, shiek of the Hanif. Jamal and Yodfah were able to escape when the party intervened. Later, the party became embroiled in a complicated plot set in motion by Jamal to kill one of his wayward Flame Mages, Ali al-Lazan. The party was able to do so, but Jamal's plan to kill them afterwards was thwarted by the intervention of Azaltan.